Wardrobe Styling – What is Style? 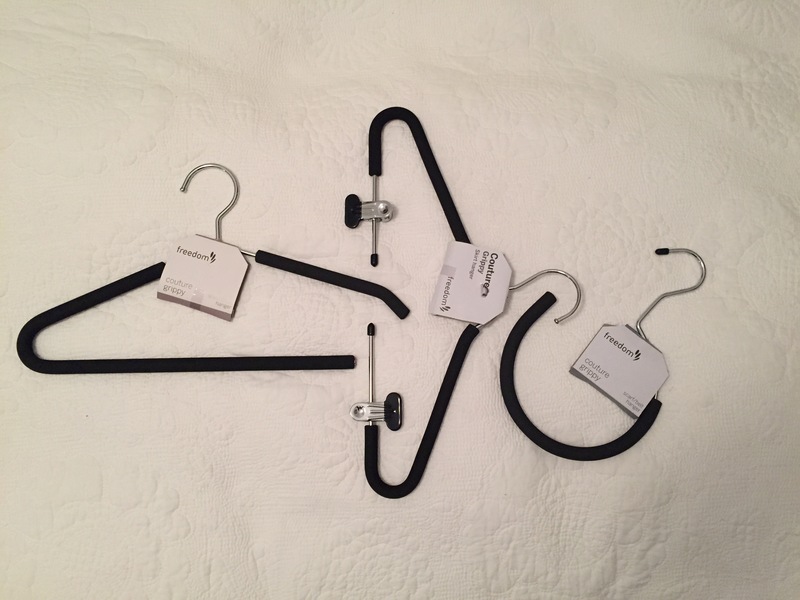 Who knew the other name for clothes’ hangers is a Couture Grippy, but that’s what I found out when I went looking for a clothes stand at Freedom Furniture and found the perfect clothes hangers instead! First problem in buying a new house, is the fact the one I fell in love with, had no wardrobes in any of the 3 bedrooms and for a girl as keen on fashion and clothes as I am, this is a serious problem. I found no wardrobe racks I liked, but spied some clothes hangers that came in three different styles, being one for scarves/belts; one for skirts and one for shirts/dresses. The word ‘couture’ had me sold followed by being practical, functional, and they look good. Priced between $2.95 to $3.95 I am happy knowing that when my clothes end up on these hangers, that they won’t end up lying on the floor, as is what normally happens with my ugly wooden hangers. If you are keen to upgrade your wardrobe, check out your nearest Freedom store, as these clothes hangers are a regular stocked item. I am sure my clothes will hang just perfectly, as will yours. Didn’t know where you could get these hangers, great advice Yellow Tulip. Love the scarf one, so practical. I can’t wait to start using them and see if they do hang the clothes better than the wooden ones or plastic. Hope your scarves start looking pretty if you manage to buy one for your lovely amazing wardrobes at home.